← Bubble bubble toil and trouble! 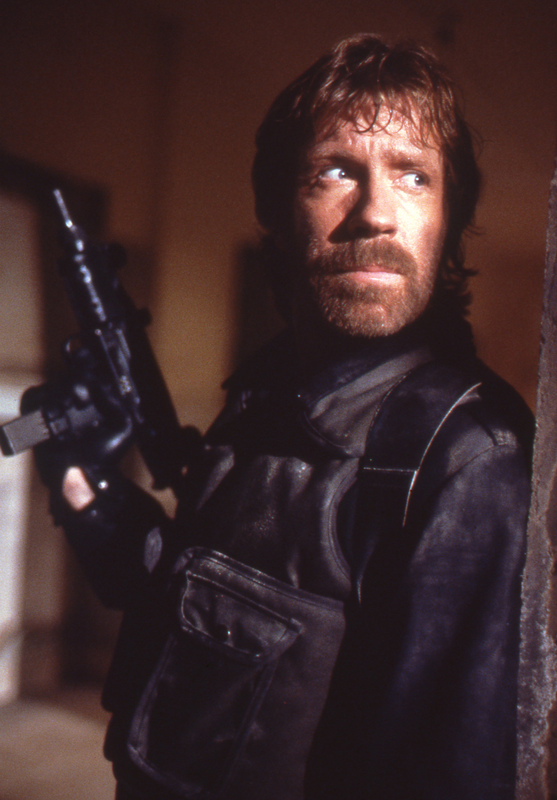 …but Chuck Norris can swim through land. Or so the saying goes. What does this have to do with anything? 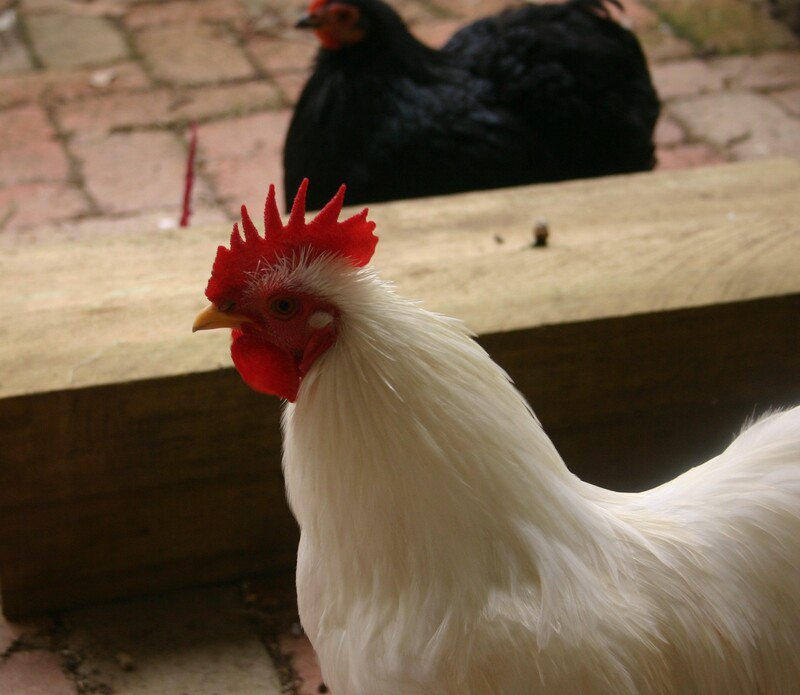 Well, we have some new (well relatively) additions to our chicken family, including our new rooster Chook Norris! 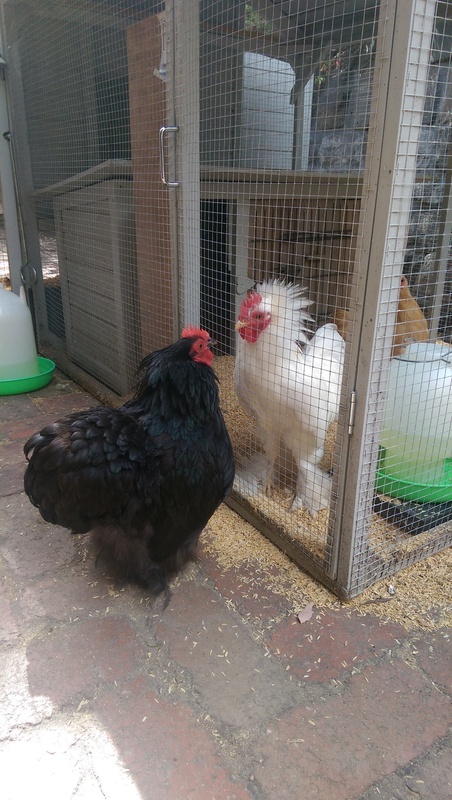 Here he is meeting the existing matriarch Rosie (little black pekin) for the first time – I think the resemblance is pretty clear don’t you? I know I know, a risky move bearing in mind we don’t live on acres of farmland and have some neighbours nearby. We didn’t intend to get a rooster really, it just sort of, well, happened. A while ago we noticed that when we had two or 3 broody chickens (which is worryingly quite often!) the other remaining chickens seem a bit lost, as if they need a critical mass of chickens in order to be confident roaming around the garden and digging in the bushes. This makes sense if you consider their flock mentality, safety in numbers and the idea that someone is always on the lookout – if suddenly it’s just the two of you then how much can you trust that the other chicken has your back and isn’t just stuffing her face with bits of foliage and small insects? 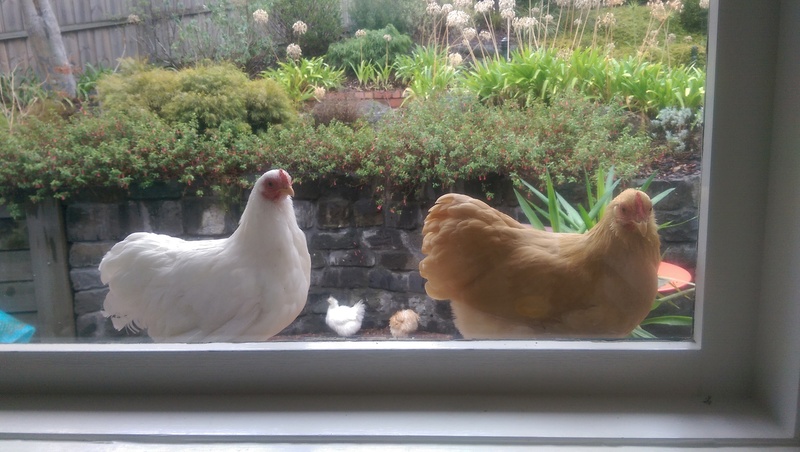 It reached a head when we had three broodies and the other two just stood outside the sliding doors looking in at us in the kitchen and kind of shrugging as if to say, “ What are we supposed to be doing?”. So we relented and decided to get a few more in an attempt to achieve optimal chicken critical mass for foraging even if some were broody. So I started to look for some other pekins to join our flock, and soon found some that were really close by, only 5 minutes down the road. The only catch was that there were 3 lovely little pekins but one was a rooster. After agonising over it we decided to give it a go, and soon Chook Norris and his two girls Helena and Culley arrived to join our mob. When we go them they were quite young, only around 15 weeks old, and very small and cute. Here they are roosting in the roof of their temporary pen. Culley (the buff one) and Helena (white small one) are really sweet, although they soon put some of the others in their place and started climbing the social ladder! 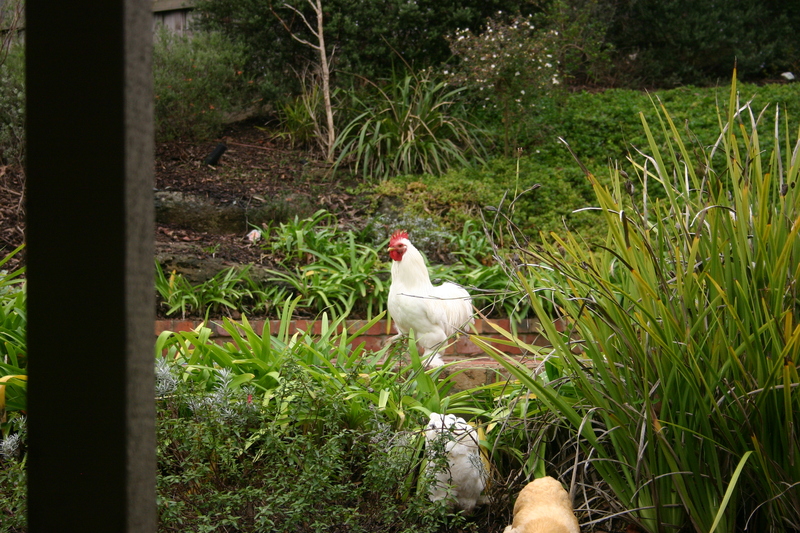 The day after they arrived, Chook Norris tried out his crowing voice – much to my dismay, he was pretty loud! Since then he has been crowing every morning, and we’ve had to add some insulation into their house to muffle him and also keep them shut in their house until about 8am to try not to disturb the neighbours. I know, I should have expected it! He’s such a cutey though, and looks after his girls really well. He was a bit unsure about some of his rooster duties at first, and although he knew enough to call them over to eat yummy titbits they weren’t so keen when they dashed over and proudly presented them with twigs and bits of dried chicken poop! He seems to have learnt from his mistakes though, and is doing a pretty good job of looking after them. Sometimes they still like to remind him that they are independent young women and don’t need a man to look after them, scurrying off to dig or dust bathe and causing him to descend into a state of panic – but all is soon forgotten if given some treats when the ladies all come running back at the sound of his manly tones calling them to food! All in all it’s been really funny watching them, and the dynamics of the group now there are a few more of them and they have a male influence. The group have settled in really well together now, and everyone knows their place so they all get along well apart form the occasional squabble. When the weather gets warmer in spring we might hatch some little chickies, and all of Jessica Fletchers broody episodes will be finally rewarded! This entry was posted in chickens and tagged chickens, sustainable living. Bookmark the permalink.